August is prime harvest season for the Peterson Garden Project, which has community gardens scattered across Chicago’s North Side. Fresh tomatoes grown in the small plot tended by our son-in-law Rocket in the Project’s Vegwater garden in the Edgewater neighborhood were a highlight of a late Sunday lunch that Emma whipped up for us. Then we went over to check out the garden. The place is bursting with colorful veg and flowers, in over 100 small individually tended plots. Tomatoes, peppers, cubes, herbs, zinnias, gotta love seeing this in the heart of a big city. We stopped for cold brew and oolong coconut iced tea and a killer brownie at Metropolis, near the Glendale El station before wandering over to Hollywood beach where we could see that the crazy stunt planes we watched on our drive into the city along lake shore drive were done entertaining as part of the annual air and water show. 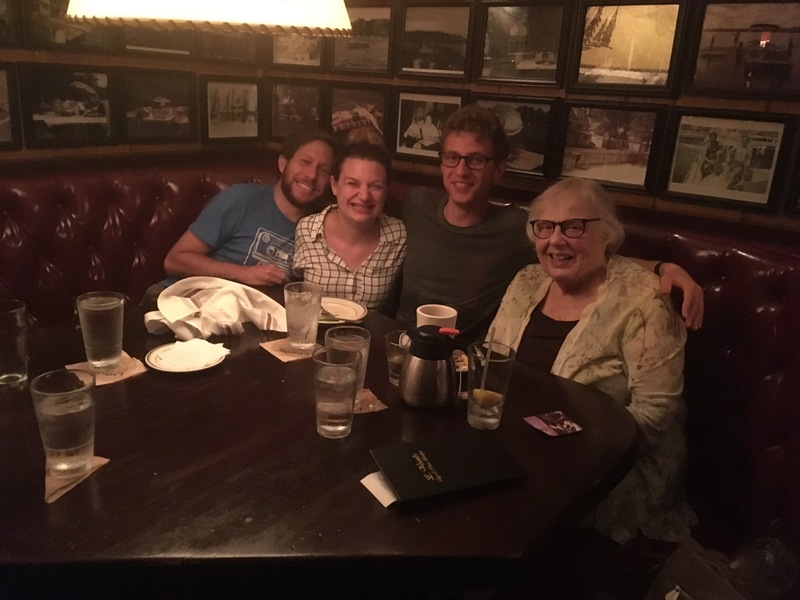 Dinner was with wonderful aunt MAT at L. May, the ode to Midwestern supper clubs in Lincolnwoid. Excellent fish (trout with capers, grilled white fish and walleye), potatoes (twice-baked, garlic mashed) and bbq ribs. Great service and of course company. Several new (or new-to-me) stands at the Des Moines Farmers Market downtown on Saturday mornings are further testament to the creative entrepreneurial spirit that is alive and well in rural America. Among my favorites is “Judy’s Husband’s Stuffed Pickles” — which not only has an amusing (if somewhat cumbersome) name but has people waiting in line for what appears to be “hand made” pickles stuffed with creamed cheese. Several ethnic food stands also caught my eye including one selling Korean bibimbap and another cooking up a mean Afro-Caribbean Jerk Chicken. We finally found an opportunity to stop briefly in Ann Arbor for a corned beef sandwich at the senses-overwhelming Zingerman’s deli. As good as I remembered. Also got a burger on the way home at a place we’ve meant to try — Redamak’s in New Buffalo near the Michigan/Indiana state line. Place was packed on a Monday for lunch and we soon learned why. The food was good and service prompt. Next time we are supposed to try nearby Oinks for ice cream, my sister tells me! For some reason, we could not get a Wisconsin map at any of the tourist offices we visited while there last weekend – and we tried several. Perhaps it’s part of some budget cutback? Anyway, it forced us to rely on partial maps we found at the tourism offices – most notably a multi-county map of good roads for bicyclists. The one we used was the West-Central Wisconsin State Bike Trails map, which includes “safe roads to ride,” “bike trails” and “Amish community.” With it, we found a pretty series of mostly letter-named roads that went diagonally from Sparta northwest to Alma on the Mississippi. I suppose cyclists wouldn’t appreciate me sending car drivers on these roads but the fact is, they were great for both. We took I-90 west to 108 north to Mindon, then VV (not to be confused with W, as I did) to Ettrick, then D, and T to Acadia, then 95 to E to Waumandee, then more E to 88 and my favorite named town – Cream, Wisconsin – and then E again to Alma. You do have to pay attention because these road names/numbers change pretty quickly. So here’s the bottom line on the deadliest times to drive, according to recent AAALiving mag: during a weekend pre-dawn rain shower in August…. – 10 percent of all fatal crashes happen on Sat. midnight and Sun. 6 a.m.
– deadliest driving month is august. One more interesting tidbit: 43 percent of AAA’s roadside rescue calls were for a tow to repair shop; 21 percent to replace batteries; 15 to retrieve keys locked in car; 14 percent to add air or change tires; 3 percent pull car from side of road and snowbanks; 2 percent provide fuel for car. – When it’s raining right? Not necessarily. It depends on how long since it’s last rained. The longer it hasn’t rained, the higher the crash risk. – Why, you ask? (Or I asked myself). A few reasons. 1) rain releases oil and other slippery stuff from dry pavements (my husband knew this one.) 2) But if it hasn’t rained in a while, drivers tend to forget how dangerous slick wet roads are (vs. if it’s rained a lot, they remember all too well.) This reminds me of my terrifying experience 25 years or so ago when I got caught in a near-monsoon in Los Angeles. The drivers there, used to sunny weather, didn’t appear to have a clue about how to drive on wet roads and sharing the road with them was NOT fun. – So is rain or snow more dangerous weather for driving? If you guessed snow – like I did – you’re wrong. The are four times as many fatalities on rainy vs. snowy days. Still more tomorrow because admit it – this is kind of interesting…. The riskiest time to drive? What’s the riskiest time to be driving on the road? Not surprisingly, it’s late Saturday night and early Sunday morning, according to Tom Vanderbilt, author of Traffic: Why We Drive the Way We Do, who offers wisdom in the May/June 2011 issue of AAALiving (which was surprisingly informative this month. – Morning rush hour presents the higher crash risk but NOT the highest risk of the most dangerous crashes. – The evening rush hour, alas, is more dangerous because it includes: people who don’t have to be on the road, more drunk drivers, and, perhaps, faster drivers (as people rush to get home from work.) The morning rush our is twice as safe – in terms of fatal and non-fatal crashes – as the evening rush.